These seven lectures on medieval missions include within their scope material on Clovis and Clotilda, Paternus, Columba, Augustine of Canterbury, Aidan, Columbanus, Brunehilde, Boniface, Willebrord, Anskar and Ramon Llull. 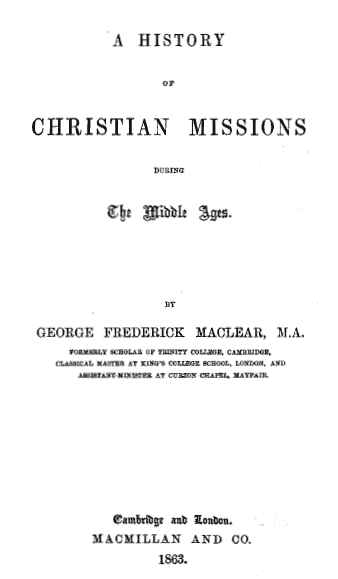 They appear on-line thanks to Redcliffe College, who recently asked me to digitise 1,000 mission books from their library. This book is in the Public Domain. The Duff Missionary Lectureship has been instituted under the provisions of the will of the late Dr. Alexander Duff. In arranging for its foundation, his son has complied with the dying instructions of his father, deviating from these instructions only to the extent of designating the lectureship by his father’s name,-a deviation which, I venture to think, will be universally approved.